This is my Ultimate aperitif digestif drink. Really though, I took all my favorite from the categories and found the balance over many constructive conversations with guests and staff in Los Angeles. 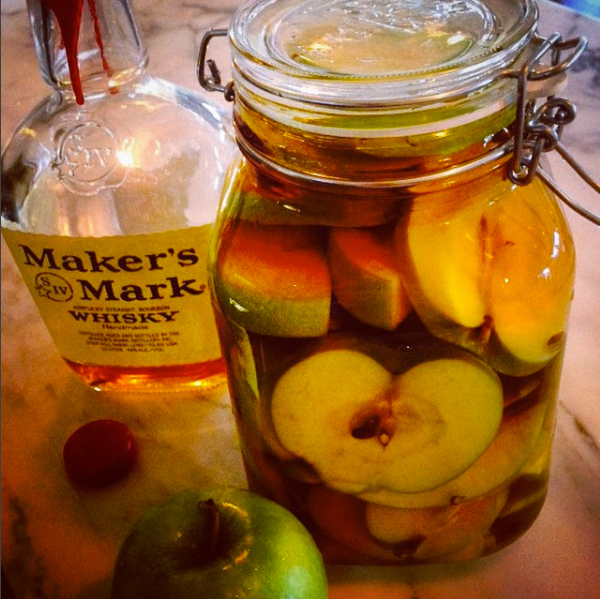 The Delorean starts with Apple Infused Whisky which is just the perfect balance of sweetness for a whiskey cocktail of this sort. Ive always preferred Aperol to Campari. Aperol is an apricot herbal concoction and it is the brother of Campari, made by the same company along with Cynar an artichoke liquor. Campari is comes across much more bitter than Aperol and the two are somewhat interchangable in drinks, if you are a Campari fan, try Aperol in your Negroni and of corse everyone should know by now what an Aperol Spritz is. Fernet Branca makes an appearance because of its intensity and i only have room for a little bit because we aren’t done with ingredients yet. Averna could make a great replacement here or Angostura Amaro is an excellent choice as well. Which brings us to the necessary ingredient of fresh lemon juice. Tawney Port of any sort will work but I really like Croft, its a nice price for the quality and it comes in a bottle that is designed for the bar. Two or three dried cloves go into the shaker but not into the glass. You must garnish this with an orange twist, its the law when you use Aperol. I like to put a massive sprig of thyme in this one, hopefully the guest allows it to tickle the nose when they sip, please don’t let one just toss it on the bar, if anything it belongs submerged into the drink.